The Indians started off their campaign on a winning note by defeating Australia in their opening game. 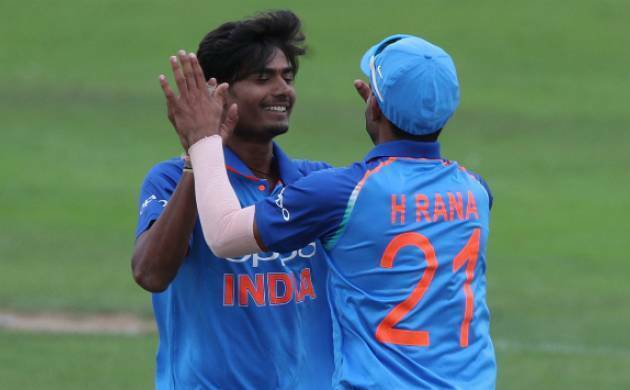 The Indian team defeated Australia by wickets in the grand finale to win the 2018 ICC Under 19 World Cup title. The Indians produced some stellar cricket all through the tournament dishing out a string of impressive wins. The Indians started off their campaign on a winning note by defeating Australia in their opening game. Leading the batting efforts was their skipper Prithvi Shaw who scored a belligerent 94 off 100 balls. Meanwhile his opening partner Manjot Kalra played a handy knock off 86 from 99 balls. Shubmam Gill stepped up the scoring rate with 63 off 54 deliveries. Down the order, Abhishek Sharma slammed an eight-baa 23 for some late fireworks. Australia's batting struggled against the pace of Mavi (3/45) and Nagarkoti (3/29) who were menacing with their pace . India bowled out Australia for 228 in 42.5 overs. Shaw was Player of the Match. Batting first, PNG were bundled out for a meagre 64 in 21.5 overs by a potent Indian bowling lineup. Spinner Anukul Roy cast a web around the PNG batsman with 5/14 in 6.5 overs. Seamer Shivam Mavi made early inroads by striking the opening blows, and Roy did the rest. Chasing 65, India cantered home with Shaw scoring 57 off 39 balls and Manjot nine off nine. India followed up their PNG win with another stellar victory against Zimbabwe U-19s. Zimbabwe elected to bat and were all at sea against spin, with Roy taking 4/20 and Sharma 2/22. A target of 155 was seemed rather too easy for the inform Indian batsmen. Kalra (90* off 59 balls) and Harvik Desai (56* off 73 ball) completed a hat-trick of wins for India U-19s. Shaw (40), Gill (86) and Sharma (50) were the main contributors for India, who were bowled out for 265 in 49.2 overs. It proved more than enough, with Mavi (2/27), Nagarkoti (3/18) and Sharma (2/11) bowling India into the semi-finals.